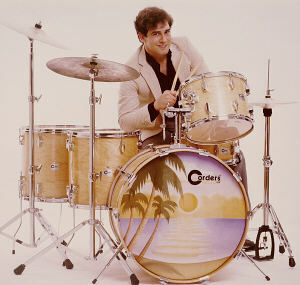 Jon Schwartz was born August 18 in Chicago- our kind of town! Jon moved to Los Angeles via Phoenix and still resides there. 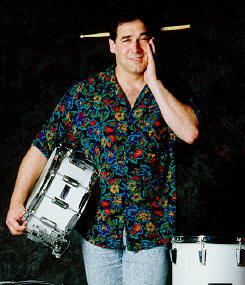 He began drum lessons at the age of 9 and has become our favorite drummer of all time! Jon met Weird Al in 1980 and "Bermuda Schwartz" was born! Bermuda's first project with Al was in September 1980 on "Another One Rides The Bus"
BERMUDA HAS A HUGE COLLECTION OF T-SHIRTS!!!!!!! NOW YOU KNOW WHAT TO GET HIM FOR HIS NEXT BIRTHDAY!!!!! ARE YOU A W.O.B? THEN JOIN THE CLUB! SEND US YOUR NAME AND EMAIL ADDRESS AND GET THE OFFICIAL MEMBERSHIP CARD! AND IF YOU HAVE A QUESTION ABOUT BERMUDA, ASK US. WE MAY HAVE YOUR ANSWER!